Saturday morning and prime time television are more prolific than ever. 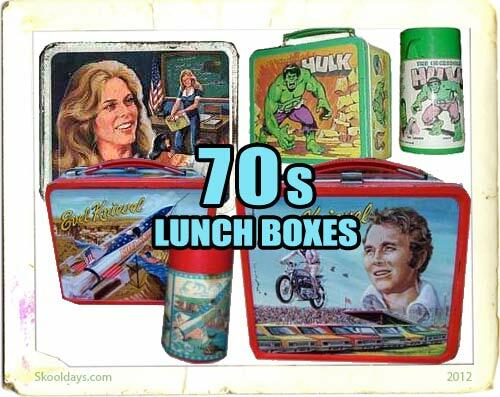 For every new show produced, a lunchbox is made, as children become walking advertisements for The Bugaloos, Hong Kong Phooey, Battlestar Galactica and The Brady Bunch. Thermoses make the transition from steel to plastic. A group of concerned mothers in Florida, worried that metal lunchboxes are being used as weapons, convince the state to outlaw their production and sale, and the first plastic boxes are made. Lunchboxes reflect trends and social activities of the day from skateboarding to disco dancing to bicentennial patriotism to BMX biking. Teenage heartthrob performers invade both the music and the lunchbox scene, as Donny and Marie, KISS, The Bee Gees and others get immortalized on the lunchboxes of future rockers. This entry was posted in LunchBox and tagged 1970 by Skooldays. Bookmark the permalink. great post. i love to collect old metal lunch boxes too. here is a very useful guide with images, descriptions and values to each one http://www.greatestcollectibles.com/lunchbox-price-guide/ hope its helpful. How do I buy a lunchbox?